Ground beef chili for two made in less than 30 minutes! A few weeks ago, I was feeling under the weather with a unique mixed bag of misery that is allergies, sinus trouble and toothaches all at once. I was a sad sap for sure. Even though I hid from everyone, my Mom still picked up in my text messages that I was down and out. My parents came over to my house the next day with all the ingredients to make this beef chili. I was overjoyed beyond belief. We plowed through the pot of chili in just a few short days, and I missed it when it was gone. I wanted to make it again, but I feared it wouldn’t taste as good if I made it. You know how the deliciousness of a dish is heightened by the fact that you didn’t have to make it? Well, I’m happy to report that this ground beef chili is just as good if you have to make it for yourself. Even if you have to do the dishes, it’s still delicious. If you have to do the dishes, everything is made in one pot. Plus, there’s only 7 ingredients in this ground beef chili. 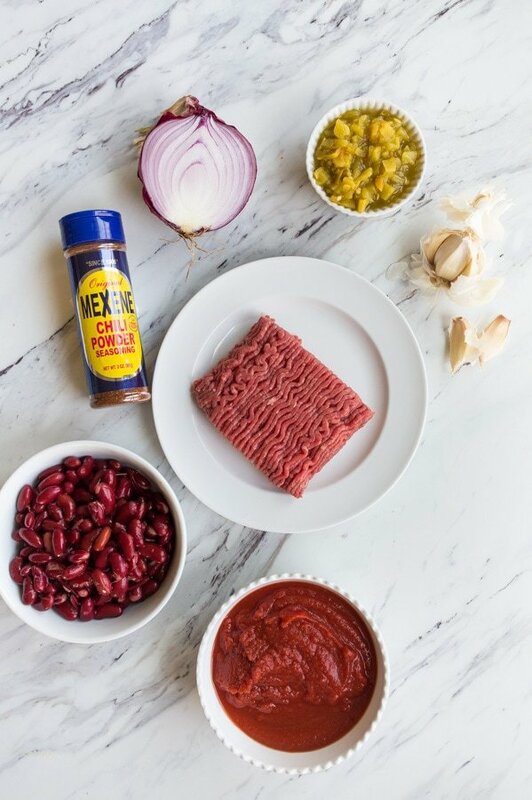 Onion, fire-roasted green chiles, garlic, crushed tomatoes, chili beans (or kidney beans), chili powder, and ground beef! You can totally make this even if it’s your first time cooking! I’m using a small Dutch oven to make this recipe. It’s the 3.5 quart Le Creuset pot, and I absolutely love it. This is the exact one I use. 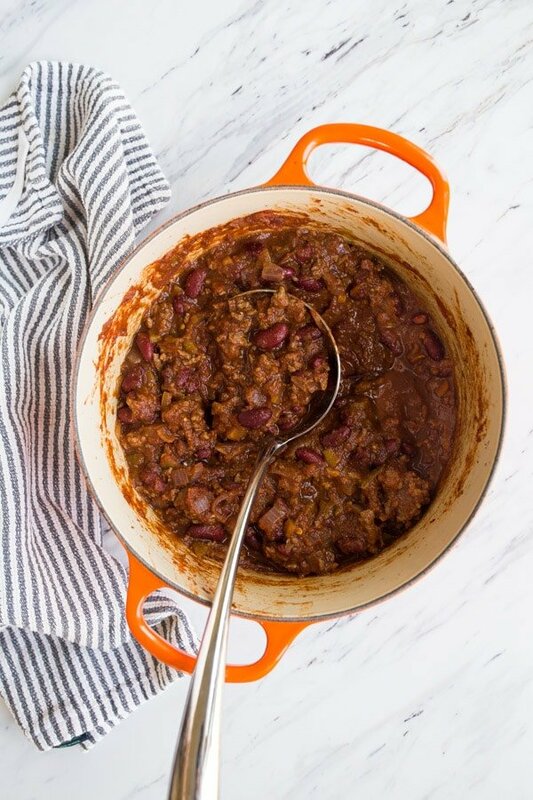 If you’ve always wanted a Dutch oven , making chili is the best reason to take the plunge! You’ll use it a ton, I promise. 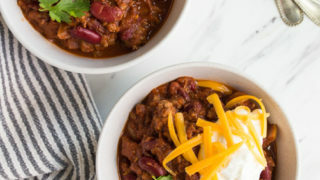 I love that this recipe is a scaled down version of chili, because I don’t need a gallon of chili leftover in my fridge. 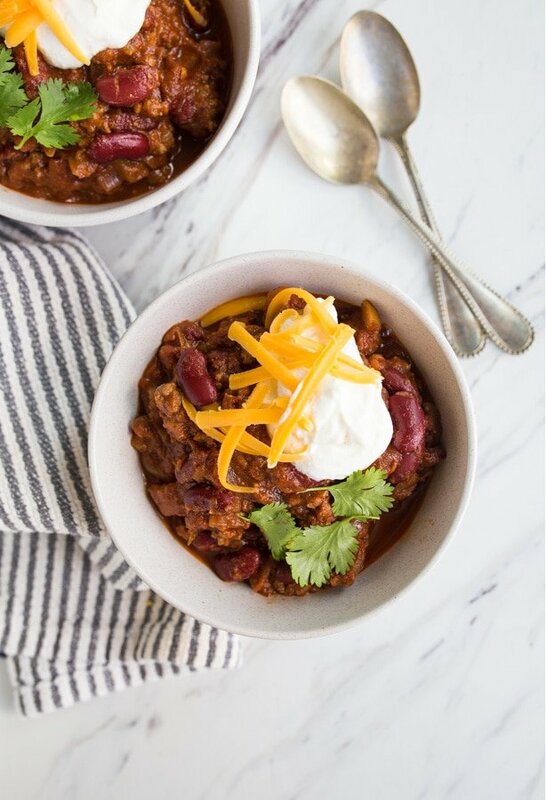 This ground beef chili recipe makes just enough for 4 bowls, no leftovers! For my family, we eat it for dinner one night and then lunch the next day. Actually, the real way my family eats it is to make it the night before, and then eat it for dinner the following day. Chili tastes even better after it sits overnight in the fridge. When we have leftovers, I suddenly want lunch at 10:30am, hah! This chili has one of my favorite pantry staples: fire-roasted green chiles! I love them! And speaking of fire-roasted green chiles, don’t miss my recipes for green chile chicken enchiladas, green chile stew, or chile and cheese stuffed chicken breast. This is the chili recipe that made me believe in chili. I sometimes have a ‘take it or leave it’ relationship with chili. 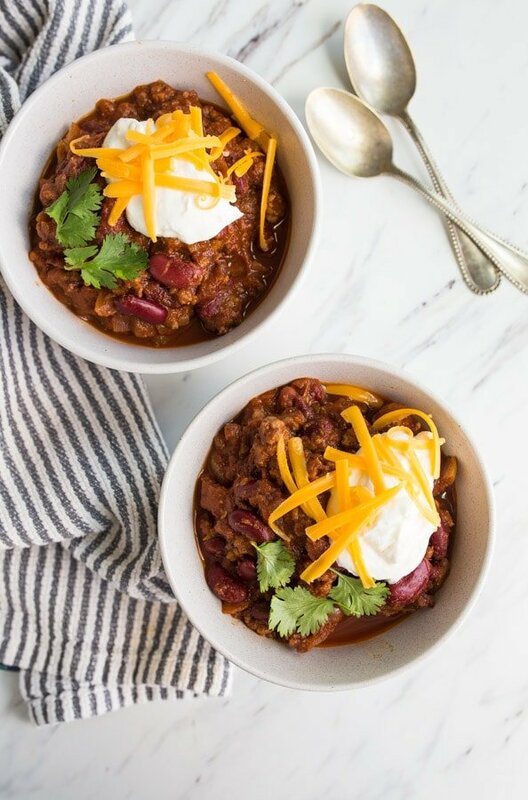 Chili can be more about the toppings than the actual ‘bowl of red.’ This one is so good on its own, that all I added was sour cream and grated cheddar! Diced onions and chips are great on top, too! My Mom says the recipe was handed to her by someone behind the meat counter at Central Market. He recommends using bison meat but I almost always use beef. I’ve probably eaten it with bison meat at my mom’s house a few times and never noticed! I’m a Texan, so you can trust this recipe for chili. I say that, but this ground beef chili recipe actually has beans in it, which is a huge no-no for Texas. But, as a Texan, I get to decide if my chili has beans or not, and this one definitely does. I have a hard time definitively calling this ‘the chili recipe’ for my blog, but my Mom reminds me that every Texan has several recipes for chili. I don’t have to put all my eggs in one basket and say ‘this is the only chili I will make from now on.’ That’s too much pressure for me! This is the only chili I will always make from now on when I only have 30 minutes to get it on the table. And, this is the only chili I will make from now on when a chili con carne sauce is needed for enchiladas or hot dogs. I have a recipe for ‘all day’ chili that simmers on the stove and uses chuck roast. It’s a whole different type of chili, in my opinion. 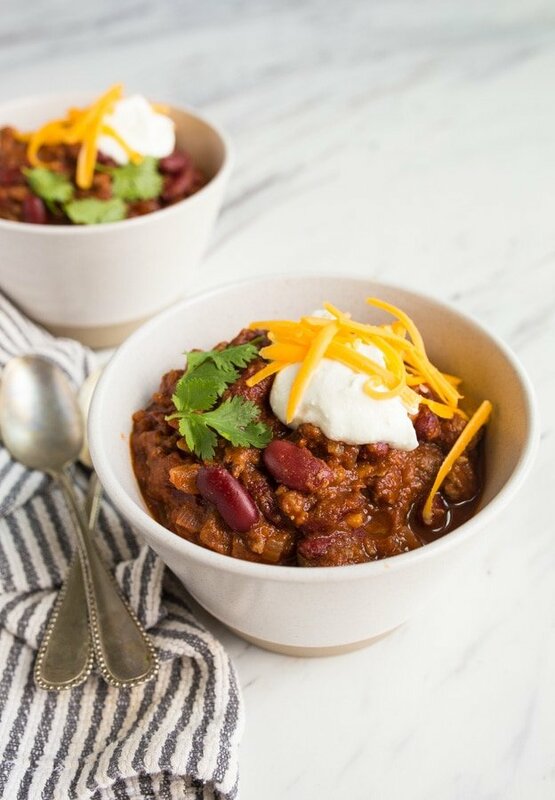 We have room for more than one chili recipe in our lives! Don’t miss my white chicken chili for two! I make this ground beef chili kid-friendly by serving it with steamed rice and corn. The rice waters down some of the ‘spice’ and the corn sweetens it up for a toddler palate. I even like my bowl with some corn for sweetness! The first time my toddler tasted chili powder, she insisted that it was spicy, but I kept trying again. Finally, she recognizes that full-flavor is not the same as spicy, and she is okay with it. Ground beef chili for two. chili toppings: sour cream, cheddar, cilantro, chips, etc. In the bottom of a small stockpot, add the beef and diced onion. Turn the heat to medium-high, and cook while stirring frequently until the beef is cooked through and no pink remains. Next, add the garlic, green chiles, and chili powder and cook while stirring for 1 minute. Finally, add the crushed tomatoes and beans. Stir everything together, add the salt and pepper, and bring to a simmer. Let the chili simmer with the lid on for at least 20 minutes or up to 1 hour. Taste the chili before serving, and add extra salt and pepper, if needed. Divide into bowl, and serve with toppings. If I can figure out pressure time for the IP, I’d say this is perfect for us..
For the IP: Cook for 10 minutes and then give it 10 minutes to release pressure. MAKE SURE YOU’VE GOT LIQUID AT THE BOTTOM OF THE POT. The liquid needs to filter down to the bottom of the pot when you stir it together or you’ll get a BURN notice and the IP will shut itself off. Thank you for figuring this out for the IP! I’m so glad you shared it with everyone here in the comments! I want to make it this way tonight! Will be using your IP method very soon.. I love this recipe. My chili recipe uses a few other spices, cumin, coriander, oregano and unsweetened cocoa powder. I know because your a Texan i trust that this is a legit recipe. Which cookbook is your chuck roast chili recipe in? I have been looking for one made with brisket, there is a restaurant that we visit that uses brisket and andouille sausage that i would love to recreate someday too.Your right, you can never have to many chili recipes! I have never eaten chilli. being from Australia, but I am going to make this unfortunately we don’t have the canned chillies but then again I had better make a milder version for my first attempt. thank you. I’m not Texan, so I suppose I have zero credibility on this, but I love chili with beans (more hearty). Made both your chicken chili and red chili this week and love them both. Had them with a side of pretzel rolls that I made. Now I found myself needing to stock up on fire roasted green chilies again, which is a great problem to have :) Thanks for your awesome recipes! Loved it!! Next time I think we will use 2 TBSP of chili powder instead of 3 for our taste buds. Topped it with fresh avocado slices, cheese, and sour cream…OMGGGGG!! Thank you for another GREAT recipe that was a HIT!! Used the “saute” button up to instruction #3, then pressured it as per MaryEllen.. It is great and will be a fall/winter regular.. I have to agree with a previous post about beans in chili even though I live in Texas! Adding beans does make it more hearty and stretches it, too. Made this tonight to top baked potatoes, and it was delicious! So nice to find a chili recipe that doesn’t make enough to feed an army for a month. But it did make plenty, my husband and I shared it and there’s leftovers for lunch tomorrow. I used black beans and diced tomatoes because it’s what I had on hand and it worked. I also added only 2 tbsp chili powder, as I like it mild, and added a few pinches of cumin and paprika to make up for it. I will definitely make this again! Thanks for a great recipe! I did a variation of this. Used 1/2 lb. spicy turkey sausage, no peppers, 1/2 tsp onion powder, 1 clove garlic, 1 can diced fire roasted tomatoes, 1 1/2 tsp Cajun spices, 1 can black beans, salt but no black pepper. When done, topped with extra sharp cheddar cheese. Had a side of cornbread, so good! Made this again today, in the IP… Will pair it with the baby back ribs which are in the IP now..